Committed towards satisfying our customers, we are involved in delivering quality Clove Oil. To provide complete satisfaction to the customers, we offer only defect-free range of products that are tested against varied quality parameters. Many commercial insecticides contain toxic substances, such as organophosphates and pyrethrins. These substances are not safe for use in homes where children and pets are present, because, if ingested or inhaled, these chemicals can cause serious health problems. Symptoms of insecticide poisoning may include breathing difficulties, redness or swelling, nausea, dizziness and even convulsions and coma. Clove oil-based insecticides are much safer than commercial insecticides and can be used in the home without fear of insecticide poisoning. Many insects, such as ants, are attracted to sweet smells, which is why they are particularly drawn to sticky spills on kitchen floors and counters. Some homemade insecticides kill insects on contact and may also have a residual effect. According to our research team, eugenol -- the essential oil found in cloves -- kills insects on contact, which makes it an excellent ingredient for use in homemade insecticides. Whole, dried cloves can be used as an insect repellent, because, though the oil has dried, the pungent odor of the cloves is repulsive to pests such as ants, flies and moths. Clove Oil-Based Insecticides : Many homeowners are turning to natural and organic cleaning products and pesticides to protect their loved ones from the harmful ingredients in many commercial products. 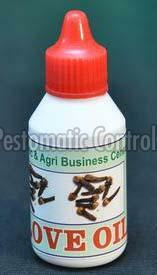 Organic, clove oil-based insecticides can be prepared from technical grade oil . The products are effective both inside and outside against a variety of insects, including ants, beetles, flies and roaches. These products often work through the combination of essential oils, such as clove oil, with diatomaceous earth, which breaks down the exoskeleton of insects on contact, causing dehydration and death. These oils are very safe to use in kitchen where no pesticide can be permitted.